Ive used Norton for years, im not new to it and know it well. Recently, ive noticed remote management setting randomly turning itself on. i even set a password to the settings to be sure no one in the house is messing with it. went to bed with it OFF, woke up... and its back on. im 100% sure i had it off. ive done this for a week now and it keeps turning itself back on. Virus? normal? how could it be normal? keep an eye on yours and see if it happens to you as well. Thoughts? Fixes? attached photo shows it on one day and off the next. I did not do it manually. google searching comes up with nothing. Running: Desktop version/up to date latest version of Norton Security. Re: Remote Management turns On by itself? Hello. Remote management SHOULD be set to on by default as it is used by Norton services. Most important of which is monitoring account status. The software may be turning itself on for those reasons. 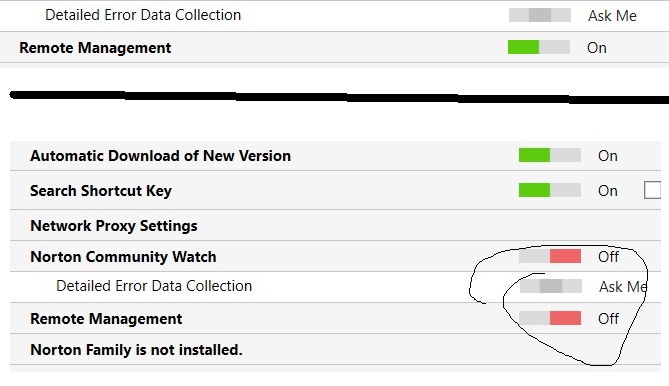 If you have the notion there is some weird activity check your history in the Norton dashboard first. Run a full system scan and see if it reports anything unusual. If nothing is there you can install and run Malwarebytes to check for other issues that may be present. It's free and 100% compatible running alongside Norton products. FWIW...my Remote Management toggles On when I login to my Norton account. The support article Remote Management states "By default, Remote Management is turned off". My Remote Management setting at Settings | Administrative Settings | Remote Management (which I always leave set to OFF) had turned itself back ON. Clicking the Use Defaults link in the Settings | Administrative Settings window turns Remote Management back to its default OFF. As bjm_ reported, if Remote Management is OFF in my Norton settings, logging in to my Norton Account at https://manage.norton.com/ will automatically turn this setting ON. I don't recall ever seeing this happen before. Is this expected behaviour for the new Norton v22.14.0.54 or a new bug? lmacri: I don't recall ever seeing this happen before. Is this expected behaviour for the new Norton v22.14.0.54 or a new bug? FWIW ~ I've seen long time. Being on Windows 10 since its inception, and on Windows 7 since it was released I cannot recall ever seeing this setting turned off without intervention. That being said I tested logging out of then back into my Norton account as lmacri had posted about, couldn't replicate the issue with my install. Also tried to replicate on both my AMD machines for the sake of differences in the architecture with the same results. Could not replicate. Wondering if investigating the last set of updates from MS and/or last definitions from Norton are warranted. I personally have had remote management show as enabled when the install completed. Also turned remote management OFF then logged into the link provided on lmacri's post. Remote management indeed re-enabled itself. I might add that previously I logged into my account through the Norton dashboard vice the link below. "As bjm_ reported, if Remote Management is OFF in my Norton settings, logging in to my Norton Account at https://manage.norton.com/ will automatically turn this setting ON." I don't use Norton Identity Safe (IDS), but I wonder if Symantec has deliberately tweaked the behaviour of Remote Management to help Norton IDS users stay logged in to their Norton Account and connected to their online vault? If this constant re-enabling of Remote Management is the new "normal" I'm not happy. I had my product key stolen from my Norton Account shortly after Symantec introduced their Single Sign-On policy in 2015 [see msgray's thread Unknown Desks Appear on My Account and my own thread Unused Installation Seats Illegally Activated (Again)] and after that fiasco I've always been very careful to leave Remote Management turned OFF out of an abundance of caution. The date of the KB that you get when you click on the ? is dated from 3/14/18. They must have made some changes. I do remember having to tell customers to make sure their remote management was on so that the device names and other information would get updated. If the default is now off, how do the customers get their information updated? This must be a recent change. I suppose customers can turn it on and it will stay on even with version updates. I haven't had to change that setting. If the default is now off, I can see why customers have issues with device names changing. The term 'Remote' is odd. All it does is allow you to log into your Norton account from another computer and see if your home computer's norton is running fine or not (still installed, etc). You cant remote yourself in and make changes. It should be called "Check status online: ON / OFF"
Turn on Remote Management: ON. I can see norton status Online. Turn off Remote Management: OFF. Check Remote Management..... ITS ON! so there we have it! strange! i didnt think that would work!! logging into your norton account turns ON Remote Management just as bjm_ said above. so if this happens to you people as well, it looks like its not an error or virus. its norton turning remote management on. ...I do remember having to tell customers to make sure their remote management was on so that the device names and other information would get updated. If the default is now off, how do the customers get their information updated? Yes, Remote Management must be enabled in the Norton settings if the licensed owner want to remotely manage certain changes to the local Norton installations covered under their license [e.g., remotely syncing multiple computers at different locations when the product key is changed, changing the default name Norton assigns to each device as I instructed in David Coffield's thread in My Services (correct) My Devices (wrong)] but it doesn't have to be turned on 24/7 on each local computer to keep Norton updated with the latest product and definition updates and correctly tracking the number of days left on the subscription. I only have Norton installed on one of my computers so Remote Management is of little use to me, and I don't like having that back door to my computer re-enabled in my settings (and without my permission) every time I log in to my Norton Account. ...and as I mentioned <here>, if you set Remote Management to ON and then click the Use Defaults link in the Settings | Administrative Settings window then Remote Management is turned OFF, so the default setting in Norton v22.14.0.54 must still be OFF. I wouldn't be overly concerned if Symantec decided to change the default for Remote Management to ON, but if I choose to turn that setting OFF I think it's reasonable to expect that it should not be able to turn itself back ON without my permission or at least some sort of pop-up warning. Microsoft seems to have a habit of changing settings when they feel like it also. I hear that they turn Fast Startup back on after every major update even when customers have decided that they want it turned off.